Blu Ripples LinkedIn Writing Services will help you capture the hidden job market; identify, increase and maintain professional connections and networks, share and developed knowledge, register for voluntary and/or paid employment thereby increasing your job search efficiency and employment opportunities. Working together with our professional LinkedIn Writer, on a one on one basis, we will listen to you, discover your professional history and objectives, conceptualise, create, update or refresh your LinkedIn profile to optimise the engagement of recruitment professionals and employers. LinkedIn is a powerful professional networking and job search tool that allows individuals to develop and maintain new and existing national and global networks thereby opening the door to new employment opportunities. To illustrate the power of LinkedIn, let’s take a moment and look at a few interesting statistics. When you consider the above statistics and the fact that LinkedIn is the preferred professional social media site for recruitment professionals (97% of recruitment professionals hire through LinkedIn); LinkedIn is not just a good idea but a necessity in your job search campaign. I AM INTERESTED IN PROCEEDING – WHAT DO I NEED TO DO? Next contact Blu Ripples on 1300 300 557 or via e-mail at info@bluripples.com.au to schedule a face to face, Skype or Telephone LinkedIn Writing Services consultation. At our Face to Face consultation please bring the above stated documentation or have the documentation close at hand if you choose a Skype or Telephone consultation. 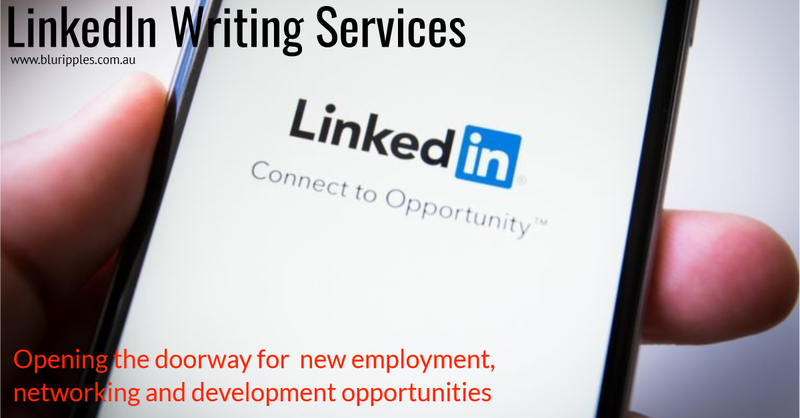 Blu Ripples LinkedIn Writing Services consultations will vary in length based on the length and complexity of your employment and educational history; you LinkedIn Profiles objective and whether your LinkedIn profile is to be created from scratch, updated or refreshed. Blu Ripples LinkedIn Writing Services will confirm the length of our consultation at your point of enquiry based on the information you provide to Blu Ripples. Our founder and professional LinkedIn Writer, Katherine Foster; whom has regularly utilised LinkedIn since 2011. Katherine is a Professional Member of the Career Development Association of Australia, a Member of the Australian Counselling Association and Australian Association for Psychological Type (AusApt) whom will draw on her professional experiences, qualifications and accreditations to help you create, update or refresh your professional LinkedIn Profile.